Ziggurat Student Apartments at Edward Square are currently taking bookings for those planning ahead for the 2019/2020 academic year starting in September. We also have availability for the current Spring Semester 2 2019 if you are looking for accommodation right now. Our newly-refurbished rooms within a selection of 2 & 3 bedroom apartments start at €225 per week. Private 1, 2 & 3 bedroom apartments are also available. These spacious apartments are positioned in the historic heart of Galway city, with every amenity nearby, including Eyre Square Shopping Centre and Galway’s Ceannt Railway Station, as well as a wealth of cafés, restaurants and shops. The location is just a 12-minute walk to NUIG, or a 15 minute cycle to GMIT. Bright, airy, and freshly-decorated, apartments offer residents generous space to study and relax. 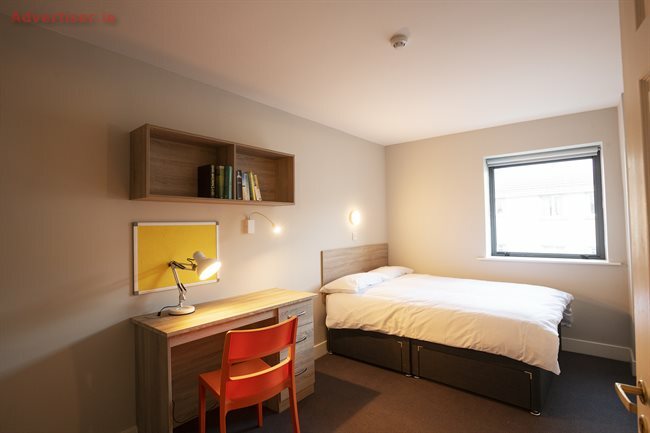 The accommodation provides students with a well-equipped kitchen, an open plan living and dining area, with many modern conveniences including a washer/dryer. En-suite rooms are available in some units, in addition to ample storage solutions. The building is perfectly secure, with gated access and a professional on-site management team to assist with residents’ queries. The all-inclusive rent covers common utility bills such as electricity, heating, refuse collection & tv license. It also includes our 400mb super-fast Wi-Fi broadband with no contention issues! We even supply contents insurance for added peace of mind. Perfect for Irish and international students alike, the Edward Square apartments have flexible move-in dates and are available now. Bookings available for single semester, full academic year or even for a full fifty-week period. Enquire now for more information! · One, two & three-bed apartment options.